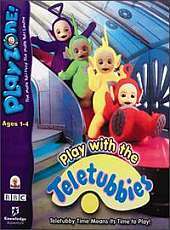 This is the first video game based on the popular kids TV series Teletubbies. Players get to choose one of the four Teletubbies, Tinky Winky, Po, Laa-Laa or Dipsy, and have to explore Teletubbyland to find objects. There's the Magic Windmill, a magic drum, a hide and seek tree, and others. There are more mini-games if you head down to the Teletubbies' super dome, where you can play with the Tubby Custard machine, the control panel, the Tubby Toaster and others.